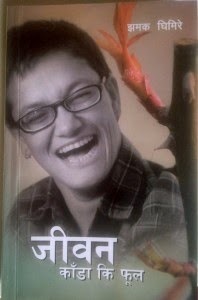 Jeevan Kada ki Phool describes the life of Jhamak Kumari Ghimire and her struggle since her childhood. It starts with her early memories of childhood. The care and support she received from her grandmother contrary to the bitter way the society treated her. The feelings of an innocent child growing up amidst the hatred of the society, her feelings and emotions she could never utter a word of. Her anger towards the discrimination she faced from the society for being born physically disabled. Her silent reactions to all those bitter things the society said to her and her struggle for existence and acknowledgement after the death of her grandmother is expressed beautifully in the book. The words and sentences used are quite similar to the day-to-day language used in the villages of Nepal. Jhamak Ghimire is considered Nepali equivalent of Hellen Keller as both of them suffered from the same disease cerebral palsy. But Ghimire, unlike Keller, belonged to a poor family in a poor country where the parents wished their physically disabled children were rather dead than suffering. She did not receive encouragement or support from her family for learning to read and write. However, she proved herself as one of the most aspiring and promising Nepali authors. Although her life had always been full of struggle and hardship, it never deterred her from her desire to learn. Her determination and strong will-power resulted in giving birth to an aspiring author and one of the most inspirational books of all times. Listen and Download "Jeevan Kada Ki Phool"